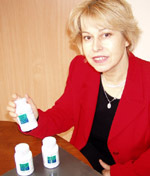 The product is a prize-winner of HERBAL OSCAR 2004 competition in Poland. Our product Kudzu Root manufactured by K&K Bioplus was developed by Polish and Canadian experts. It appeared on the Canadian market and next was registered in Poland by GIS (Polish Food Inspection Agency). Kudzu Root product is available in herbal stores and pharmacies in Poland. It is also permitted to sell on European markets. ATTENTION: enclosed information referes only to Kudzu Root made by K&K BIO+Inc Toronto, Canada.